« You thrill me, LORD, with all you have done for me! Pray more and worry less. Surround yourself in the Word and things that praise Jesus. This prayer time with God, this Advent season focused on the coming of Jesus, my family each and everyone of them, my health, the body that God as blessed me with that enables me to do what I do, for the blessing of being able to work with my son. For all the little things that workout in the end proving we need to pray more and worry less. Dear Lord God, Abba Father, thank You for another day and each blessing. Lord Your tell us and try to teach us that we must take heart for we are going to have trials and sorrows. As stated in today’s devotion, I don’t like it this truth, but it reminds me of me need for You. In that I am blessed. So many of Your truths are beyond my understanding, so I ask Your help in walking one step at a time. Praying without ceasing. With my focus only on You. In Jesus name I pray. Glory be to the Father and to the Son and to the Holy Ghost; as it was in the beginning is now and ever shall be, world without end. Amen. Then you will experience God’s peace, which anything we can understand. 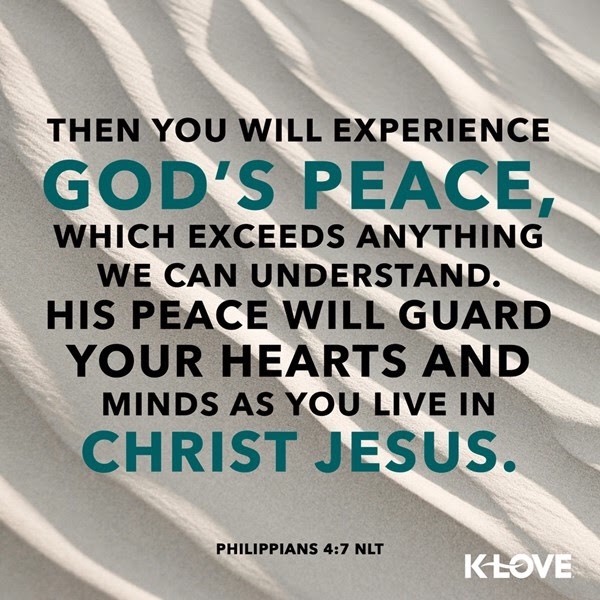 His peace will guard your hearts and minds as you live in Christ Jesus. not care for you more than He cares for the birds overhead? This entry was posted on December 19, 2018 at 6:41 am and is filed under One Walk. You can follow any responses to this entry through the RSS 2.0 feed. You can leave a response, or trackback from your own site.